Diabetic retinopathy. 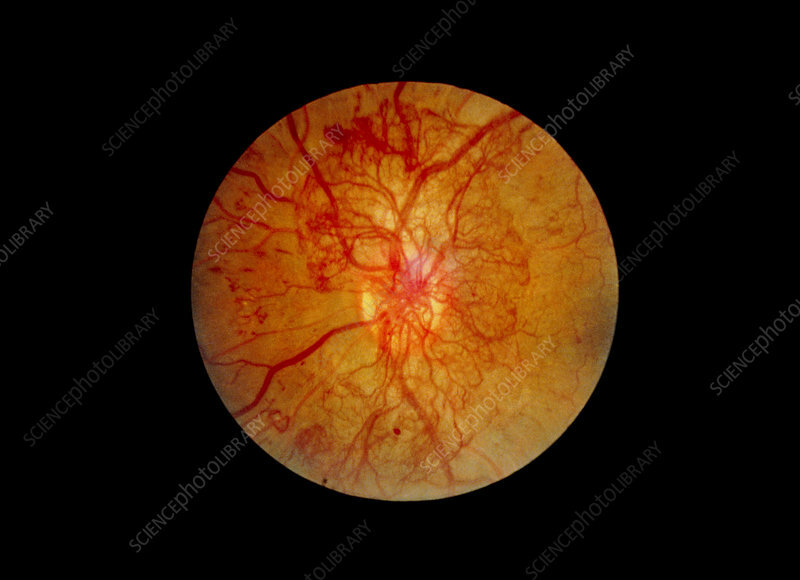 Ophthalmoscope view of the retina of the eye in a diabetic patient showing retinopathy. Here, the retina has developed a large number of blood vessels. Blood haemorrhages or tiny aneurysms (balloon-like swellings of blood vessels) are seen as red dots, reducing bloodflow. This in turn causes more blood vessels to form. Diabetic retinopathy describes the damage to the blood supply of the retina that occurs as a complication of diabetes. Retinopathy impairs sight and in severe cases leads to blindness. Treatment by laser may be successful in sealing blood vessels, causing them to regress (see photo: M140/178 after laser treatment).